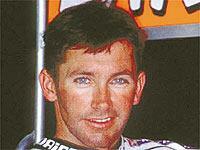 Troy Bayliss has wrapped up the WSB title. Ask him how he did it and how he feels in a live web chat session in our TALK BIKES area on Thursday, September 14 at 6pm. Bayliss, who won the British superbike title with the GSE team that now runs Hodgson in WSB, says he’s completely overwhelmed by his success. Congratulate him by visiting our VIP Lounge on Thursday (we’ll reveal a precise time later in the week) and putting your comments directly to him. The VIP Lounge is a chat room we only open for special occasions like this. To ask him a question, you’ll need to be registered and logged in (if you haven’t already registered. Then enter the chat rooms via Chat Room 1, before clicking on the link to enter the VIP Lounge. If you want to make sure your question gets asked, make sure you are there early, as there will be a lot of people eager to ask questions. If you’d rather chat with your friends about what Troy has to say, then go to Chat Room 2, which will have a live broadcast of the webchat. And don’t worry if you can’t make it. You can email your questions before Thursday lunchtime, to daniel.thornton@emap.com. There will be a full transcript of the chat published on the site, and there will even be a downloadable soundfile, so you can here Troy speak for himself.